I was at my personal trainer’s housewarming a few weeks ago. As you can imagine, it was full of fit and healthy people and delicious and healthy food. I got talking to some other people trained by Kathy who were training for their first marathon. High five to them but call me shallow, all I could think of was all the things they had to give up. There was sleep for starters (they have a 4.30 AM run club!) wine and even curry! After dumplings and cake, curry is surely my favourite food group so I was a bit sad when someone told me that curries are not healthy, hence the curry abstinence. I wish I’d had the wherewithal to show her this recipe, because it’s about as healthy as it gets, bar the curry paste that is! Recently, I’d reconnected with an old friend and invited him around for dinner. He doesn’t get cooked for often so I asked for his dinner requests. I didn’t need any encouragement when he said he fancied a curry but I was horrified when he arrived in a beautiful white, shirt with curry on the menu. I was sure that this rich tomatoey sauce and his crisp white shirt was a recipe for disaster so I layered him up with two napkins and an apron just to be sure, to be sure. As it was, he didn’t spill or splatter a drop unlike me who almost took out the title for World’s Messiest Eater! 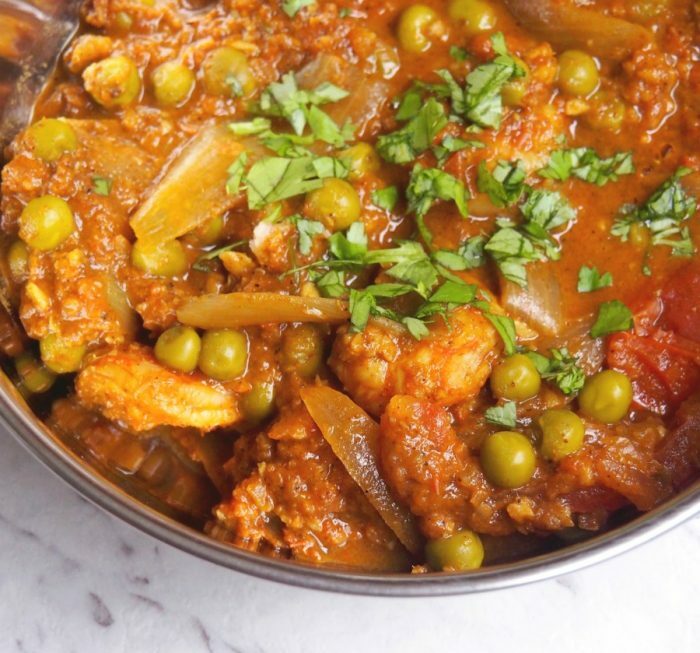 Low in fat, high in fibre and big on taste, this curry is a winner dinner. 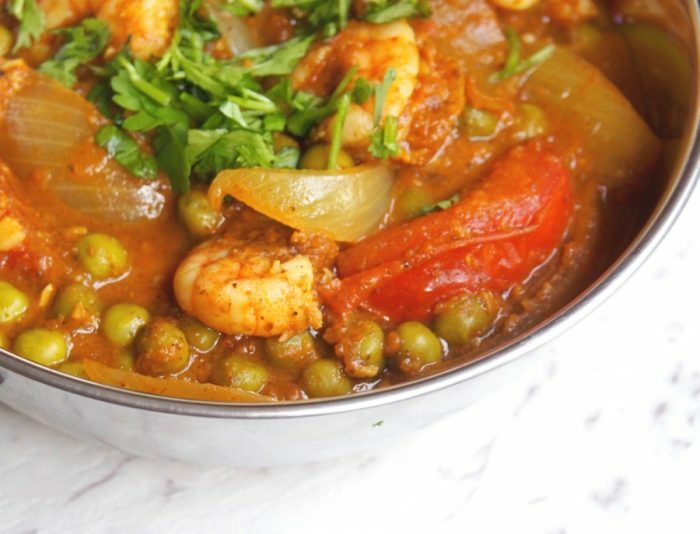 I like to make it in the slow cooker (it only takes about 4 hours) for a fuller flavour but if you want your curry in a hurry you can make it on the stovetop. Are you a messy eater too? What’s the one food you couldn’t give up? Heat the slow cooker if necessary. Whizz the oil, ginger, garlic, curry paste and all but eight of the tomato wedges to a wettish paste. Scrape into the slow cooker and stir in the onion wedges. Cover and cook on HIGH for 3 hours until the onions are tender. 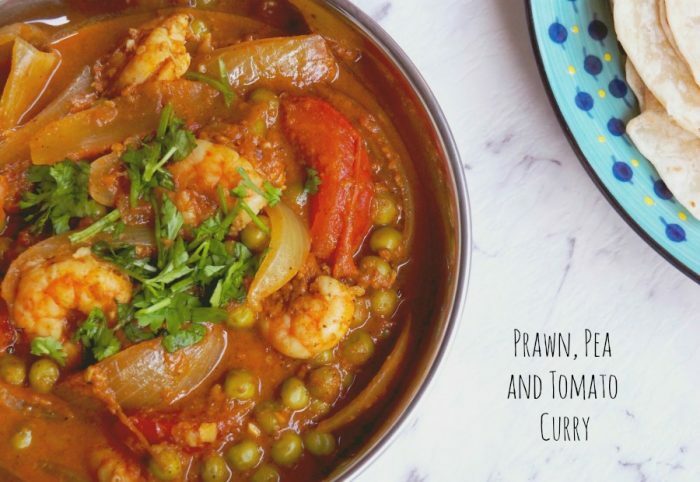 Mix in the remaining tomato wedges, prawns and peas. Cover and cook for 30 minutes – 1 hour, until the prawns are cooked through. Scatter with coriander, then serve with rice or roti. Heat the oil in a pan and fry the onion over a medium heat for about 5 minutes until starting to soften and brown. Whizz the oil, ginger, garlic, curry paste and all but eight of the tomato wedges to a wettish paste. Add the curry paste to the pan and stir for 30 seconds until fragrant. Add the remaining tomato wedges and the tomato mixture to the pan. Let it bubble over a medium heat for about 5 minutes, stirring occasionally. 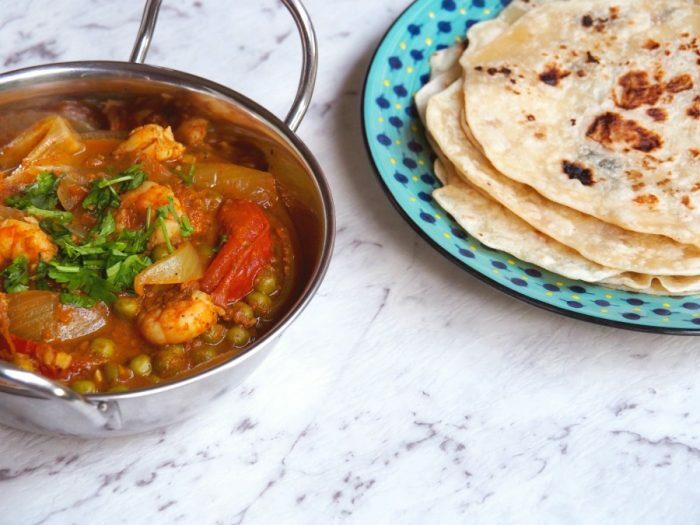 Mix in the prawns and the peas and cook until the prawns are pink and cooked through. Scatter with coriander, then serve with rice or rotis.